Published: Dec 12, 2012 to ? 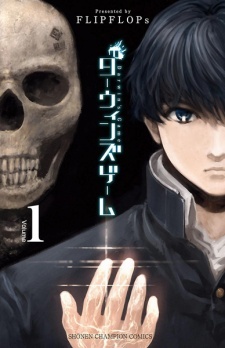 Darwin's game is currently new with only a few chapters but looks like it could be awesome, to me it looks like a cross between "Marai Nikki" and "Gantz". A death survival game that involves phones again, but instead a game app, it is psycho with a girl again which helps guide the loser main character through the game. It relates to Gantz as the game may look like its in a different world but it stilll effects the real world's people and enviroment. It also has the same gory like and bloody content as gantz as people just end up dying all around. With the anime adaptation of Darwin’s Game being announced, it felt like the time to write a review of the manga so far. First off, Darwin’s Game is an engaging series. The story draws you in quick, and while it might not be an innovative series, it is an interesting combination. The action scenes and use of “Sigils” (basically superpowers) are well drawn and make for entertaining fights. The combination of fighting styles including martial arts, guns, and other powers also add a nice change of pace compared to an classic battle royale series. There is little downtime between arcs so the pacing can be a bit fast, but this only allows for easier binge-reading. As for the characters, they are explained well and develop at a good pace over the course of the series. Most motivations and backgrounds make sense in the story, and you can easily form opinions of them. The art is consistent and some of the gorier scenes are extremely detailed as well. Action scenes are easy to understand and the transition between subdued scenes and intense battles is very well done. By the time I submit this, Chapter 27 will be out for a couple days. This manga is a fairly active manga, being updated about once or twice every month due to the scanners. I don't write reviews often, so I'll cut to the chase. This manga is a perfect ten in my book. The story is completely unique, and portrayed beautifully by its gorey art style. The story had me hooked at all time. I plan on rereading it while I wait for the next chapter (as I just picked it up again from where I left off, about 6 months time had passed). The art is amazing. Both blood/gore and character design is amazing in this novel, and is full of guns, swords, a loli, and a slight romance that isn't a romance but still kinda is. Because Manga. The character would have had a 100/10 if I could pick bigger numbers. I loved the characters design, as I'm sure you're going to end up liking at least one character specifically, even though all the characters are great. There is huge character development and each and every character is unique. I personally enjoyed the manga and can't wait to read more of it; that's why it has a perfect 10 in my review. Darwin's game is yet another survival/battle royal manga, but what makes it special? Well the conditions and setting. Yet while it is still to early to compare this with other examples of this genre, it is already apparent that this manga has lots of potential. Though it is full of cliched character and unnecessary fan service still the premise makes it shine and gives a hope for future. This starts quite suddenly as the protagonist is invited to a mobile social networking game/mmorpg and he decides to give this a try. Then the chaos starts as he is thrown into a world of battles, of various unique abilities and a way to get rich by means of killing others. The system of converting points by defeating others into money gives it that much edge of intensity and the subplot of police investigating the consequences of this game on the real life were really enjoyable too. The art is gorgeous: each characters are drawn with care and has certain uniqueness. The action scenes are fluid and intense. This really gives the overall experience a total boost as each sequence is easy to understand. The characters on the other hand are not anything to write home about. There is a typical only 'wanna do the right thing' mentality protagonist and a loli who seems to be the heroine, the villainous are characters are as such and there is not that much delving into character psychology and variety in the characters as I would have liked to have here. Some of the side characters specially the investigating duo gives a hope for some enjoyable sub plots in the coming plot-line though. While this is still early days for the manga and any speculation would be premature, yet I hope the author does identify the strong points of the series and improves upon it to deliver fun ride at least.